“The 2nd pick in the 2015 NBA draft will be chosen by, the Los Angeles Lakers!” Our luck in this years draft was absolutely huge, as our record indicated we would not have a top 3 pick, and somehow, the basketball gods blessed us with the 2nd pick. 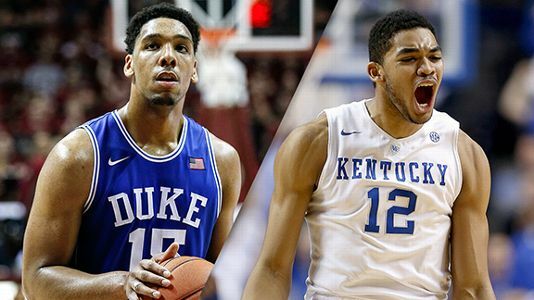 That means we can get one of the two dominant big men, Karl Anthony Towns or Jahlil Okafor. Also available is the explosive shooting guard Deangelo Russell, who has drawn comparisons to the likes of James Harden. So one draft pick will suddenly put us back in basketball contention? Absolutely not. However, having this young talent actually makes us attractive to the 2015 free agent pool, as we gave a great chance at superstar forward Kevin Love. The starting line up is potentially Jordan Clarkson, Kobe, Randle, Love, and Okafor. Suddenly, our terrible season doesn’t seem so terrible at all. Even if we aren’t able to attract a great free agent, not doing great this year can be a blessing in disguise. That’s because it would potentially give us another lottery pick in the 2016 draft, and more cap space for the DEEP free agent class of 2016. All in all, I believe we will be a force by the 2016-2017 NBA season.